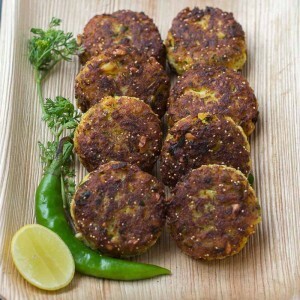 Cauliflower Vadai recipe. Easy after school Indian evening snack idea. Nice roasted and fried cauliflower vadai. Gobi Roast Vadai. Kid friendly quick recipe. Crisp Cauliflower fritters. Cauliflower is the most versatile vegetable ever. There is a very funny quote about Cauliflower. “Cauliflower is nothing but cabbage with a college education.” The possibilities of a Cauliflower is endless. 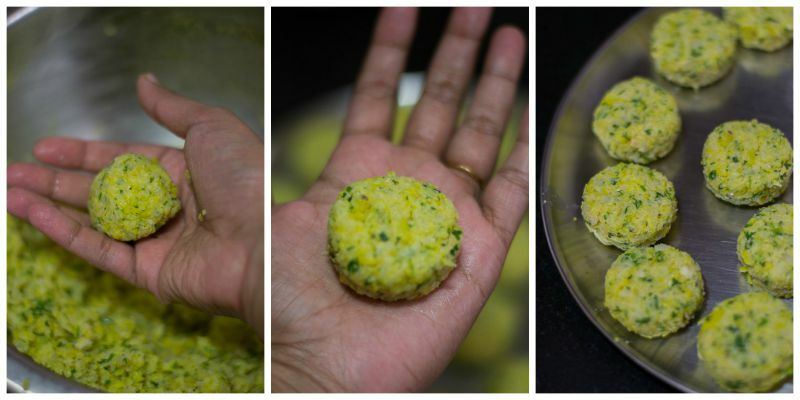 This is a very easy to do Cauliflower Vadai that can be put together in minutes. The cauliflower gets nicely fried and roasted along with other spices and makes for an excellent easy evening snack. This Gobi Vadai is a great school lunch box idea too. This is a very kid friendly after school Indian snack. 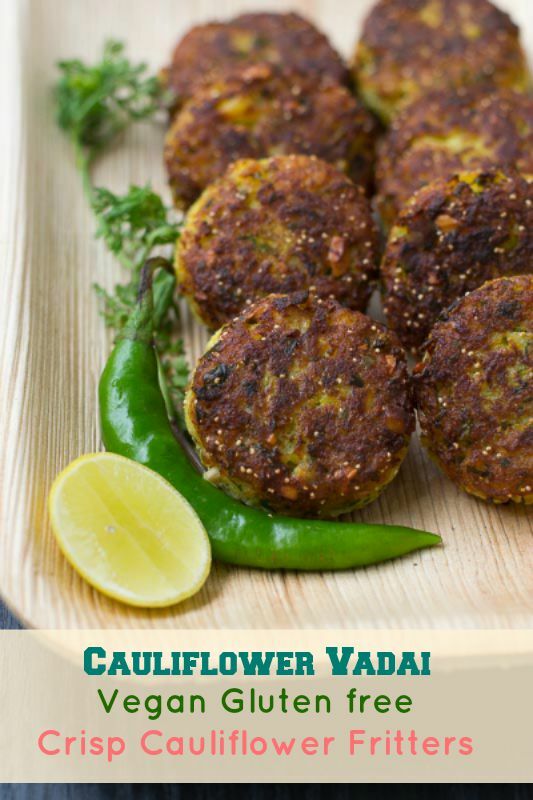 Lets make this tasty shallow fried Cauliflower Vadai – Crisp Cauliflower fritters. Wash the Cauliflower in water and cut it into florets. 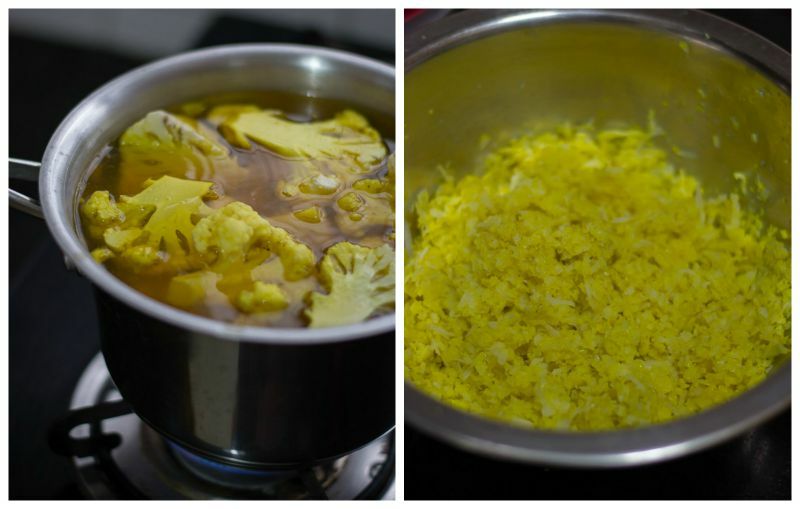 Bring a big pot of water to boil , add in turmeric, salt and the Cauliflower florets. Let it boil for 5 minutes until half done. Remove off heat. Drain the water. Grate the Cauliflower florets in a wide grater. If the stems of the florets are very hard to grate, chop them finely with a knife and add. Set aside. 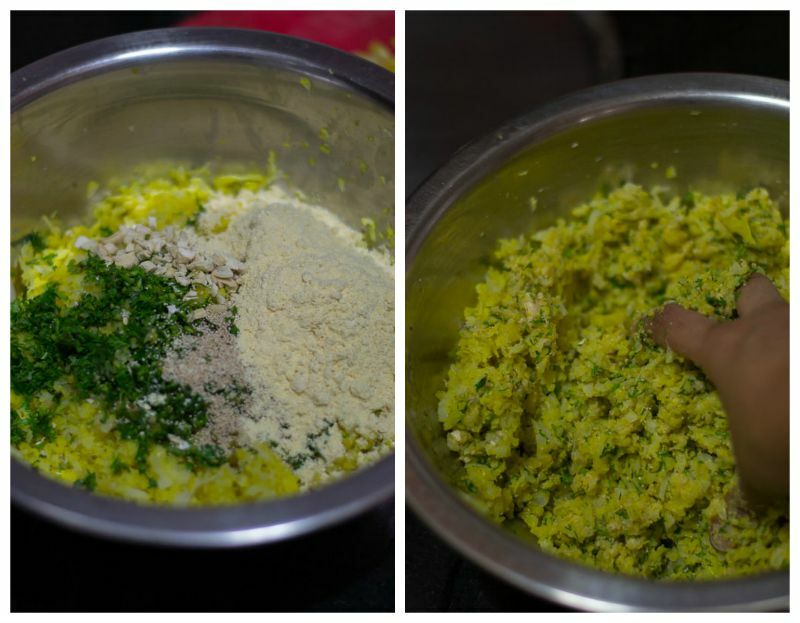 Take a bowl and add in the grated Cauliflower, finely chopped green chillies, finely chopped coriander leaves, poppy seeds (khuskhus), finely chopped cashew nuts, salt and besan (chickpea flour). Mix everything well. Do not add any water at this stage. mix well with your hands to combine. Add a tablespoon of water at a time if the mixture is very dry. Add water only when really necessary. Slightly oil your hands and form 2 inch cutlets / patties with the mixture. Make sure the patty is tight and even on the sides. Gently even out the sides by pressing with your hands. Set aside. Heat oil in a flat pan until hot. 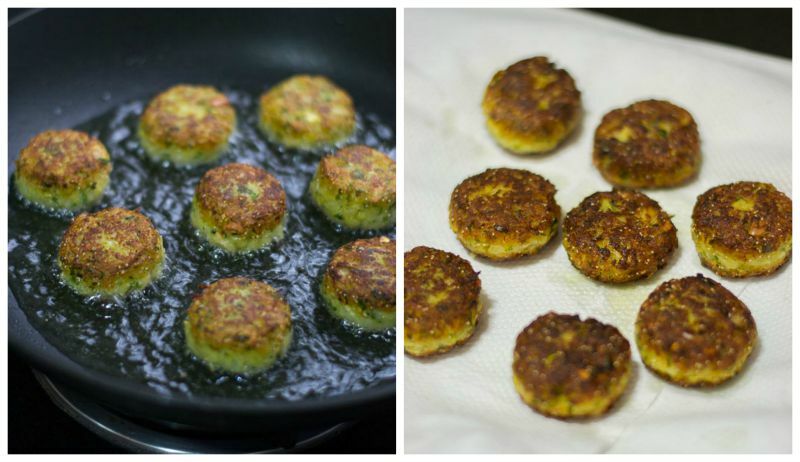 Shallow fry the Cauliflower vadai for 2 minutes on each side on medium flame. Do not turn the vadai often. It might break. Once brown on both sides, remove the shallow fried vadai and drain on paper towels. 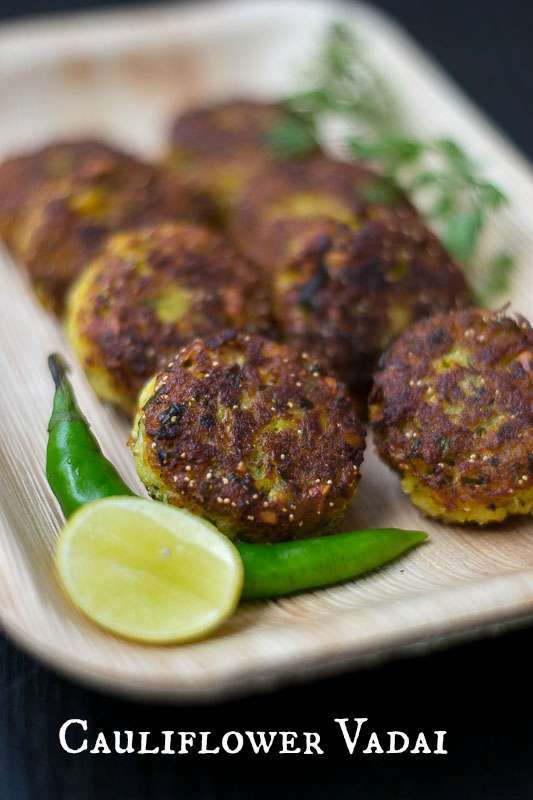 Serve Cauliflower Vadai – Crisp Cauliflower fritters hot. Additional bonus – Its yummy, Vegan and Glutenfree. Cauliflower Vadai recipe. Easy after school Indian evening snack idea. Nice roasted and fried cauliflower vadai. Kid friendly quick recipe. Wash the Cauliflower in water and cut it into florets. Bring a big pot of water to boil , add in turmeric, salt and the Cauliflower florets. Let it boil for 5 minutes until half cooked. Remove off heat. Drain the water. Grate the Cauliflower florets in a wide grater. Set aside. Take a bowl and add in the grated Cauliflower, finely chopped green chillies, finely chopped coriander leaves, poppy seeds (khuskhus), finely chopped cashew nuts, salt and besan (chickpea flour). Mix everything well. Do not add any water at this stage. mix well with your hands. Add a tablespoon of water at a time if the mixture is very dry. Slightly oil your hands and form 2 inch cutlets / patties with the mixture. Set aside. Heat oil in a flat pan until hot. Shallow fry the Cauliflower vadai for 2 minutes on each side on medium flame. Do not turn the vadai often. It might break. Once brown on both sides, remove the shallow fried vadai and drain on paper towels. Serve Cauliflower Vadai - Crisp Cauliflower fritters hot. Hi, nice recipe! If we want to deep fry this, same consistency is ok or we have to make itmore dry? I made these today, and the vada was awesome. I didn’t boil the cauliflower, though, but blitzed the florets in a food chopper along with all the ingredients except salt and besan. 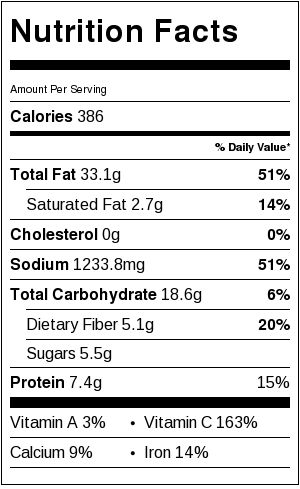 The cauliflower texture was similar to finely grated, and the ingredients were all mixed well. Also, used a paniyaram kal for making these.